This blog explains what measures are, and how to create them. 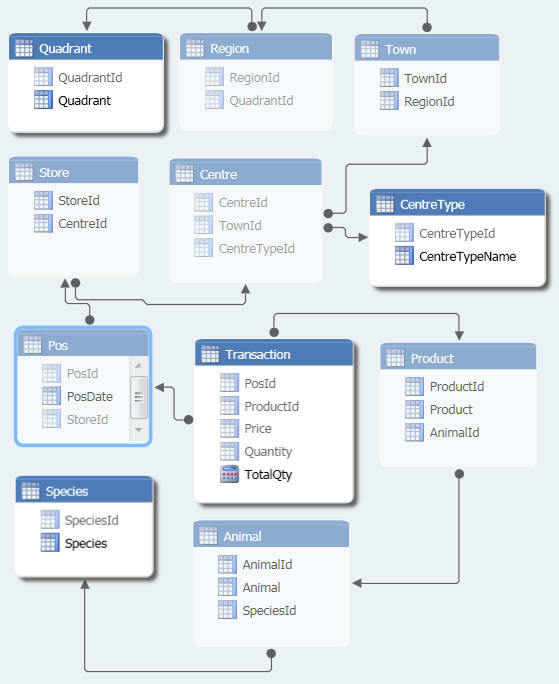 This is the must-read blog in this entire SSAS Tabular tutorial. You'll need a thorough understanding of what measures are and how they work to create DAX formulae, and you should be confident you understand the concept of query context explained below before proceeding further. For this blog, I've imported all of the rows in all of the tables shown (there are no filters applied). I've also created a slicer, and am using this to show data just for the Retail Park centre type. 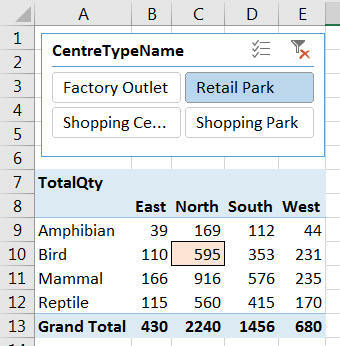 What I want to do is to look at the shaded figure 595, representing the total sales for Bird products in the North region in Retail Park centres. 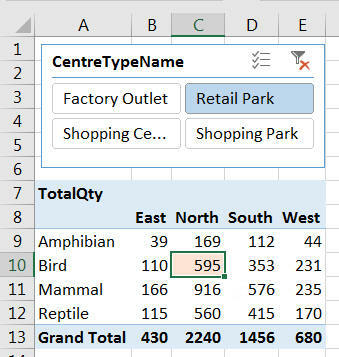 SSAS Tabular works out the value for each row for a calculated column - there is no aggregation involved. A measure ALWAYS involves aggregation (whether this be taking the total, maximum, minimum or count of the underlying values for the pivot table cell in question). 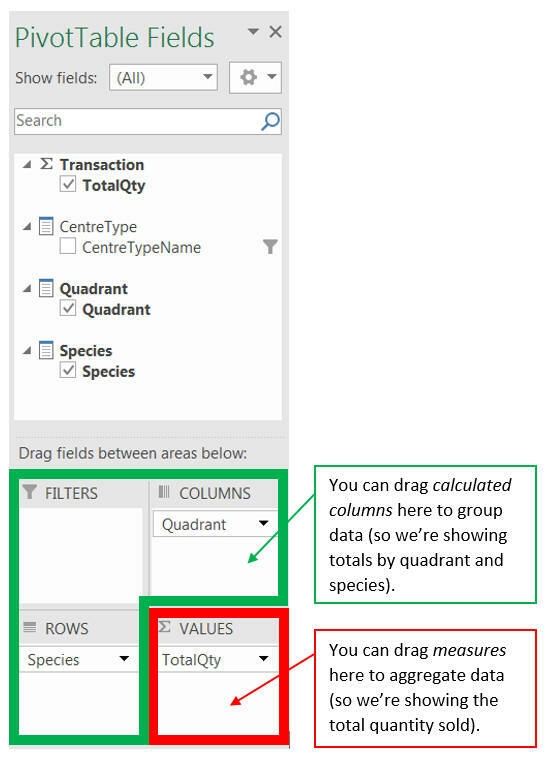 Calculated columns can only be filters, slicers, row or column headers; measures can only go in the VALUES section of a pivot table. In this respect SSAS is less forgiving than its little sister PowerPivot, which allows you to put measures anywhere. 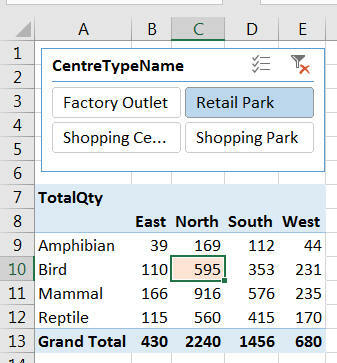 The figure 595 is obtained by summing the quantity sold for this pivot table cell's query context (see below). 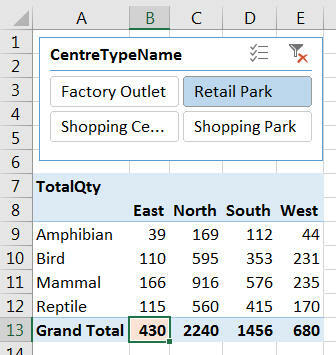 The word "tuple" is borrowed from SSAS Multi-dimensional, but is a useful way to show the query context for any calculation. You should be 100% certain you understand this concept before continuing with any part of this tutorial! Having now got the measure of measures (that's a poor pun), let's look at how to create them!